I made this on Saturday evening after a full-on day of collecting, sorting and processing the meat from our piggies. I worked very, very hard all day – this made it all better. It is very much based on a recipe by Ottolenghi from the Guardian on Saturday – see here). In fact it is so based on it that I can’t remember what was different between my version and his, although I am sure something was – but I am never as meticulous as he is – I cut corners – especially when I am exhausted. This recipe is also reason number 46 why I collect the blood from our pigs. My crumbly black-pudding dissolved a little into the tomato sauce and gave it such a delicious richness. I may try adding it to other stews and sauces. Even if you don’t generally eat meat, blood surely doesn’t count – does it? It is generally considered a waste product and washed down the drain (or something) – shocking I know. I religiously collect all ours (with the help and support of the lovely people at our tiny, local abattoir) and freeze it. But there is only so much I can consume – if you fancy any, give me a shout and you can come and have a tub. The polenta would be great with a mushroom ragout or ratatouille or something if you wanted to make it vegetarian or vegan (omit the butter for vegan) – but secretly I still think a splosh of blood in a mushroom ragout would improve it – maybe my iron levels are low and this is why I am craving blood so much …. I digress … here is the recipe. Sweetcorn polenta with sausage and black-pudding ragout: 50g polenta, corn from two ears of corn, some skinned sausages or sausage meat (hee hee we used sausage meat from our Oxford, Sandy and Black piggies), couple of slices of black pudding (I used some I made following the recipe by Ruhlman – see my post on it here for recipe), couple of handfuls of cherry tomatoes (or bigger ones cut up), 300 ml of chicken stock (or water), onion (chopped), one clove of garlic (crushed) generous 1/2 tsp of ground coriander, cumin and sweet smoked paprika, tbs of harissa, 1 tbs of tomato paste, spoonful of butter, olive oil. Polenta – Cook corn in boiling water for 5 minutes or so. Put the stock, butter, corn and polenta in a pan and cook until it seems ready – it will come away from the sides. I had to add more water to mine (but then I used regular not quick-cook polenta). 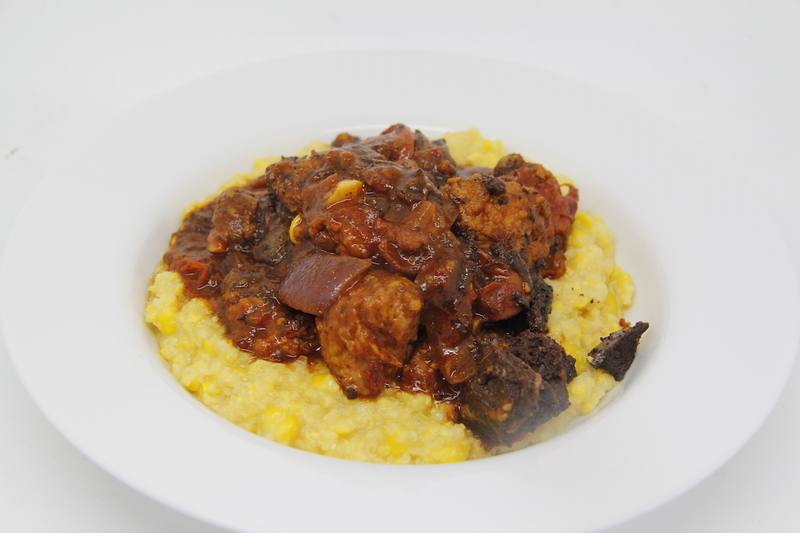 Ragout – To make the ragout, heat the olive oil and fry the black-pudding for a few minutes, then remove from the pan. In the same pan fry the onion and sausage chunks until sausage is brown and onion soft. Add the garlic and spices and gently fry for a minute. Add in the tomato paste, harissa, tomatoes and some water. Let it simmer gently with a lid on. After 15 minutes or so remove lid and simmer a bit more until the sauce has the consistency that you want. Season to taste. Add the black-pudding back in and stir to heat through. Serve on top of the polenta. N.B. I was far too exhausted to take photos of the making of this dish – it was gone 8pm. And I know what was different between my version and Ottolenghi – he recommends using cumin seeds toasted and lightly crushed, but I am lazy and used ground cumin. He also added fresh coriander to his. ← If you had to choose between turkeys or goats …..